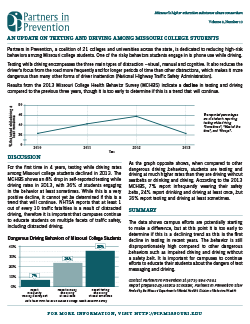 For college students who drive vehicles while on campus, it is imperative that they are concerned with their driving habits and practices to keep themselves and others safe. Impaired and distracted driving negatively affects drivers visually, manually, and cognitively. Unsafe driving practices also put the driver, passengers, other vehicles, and pedestrians in danger. Compiled here are resources to promote safe driving practices for students. 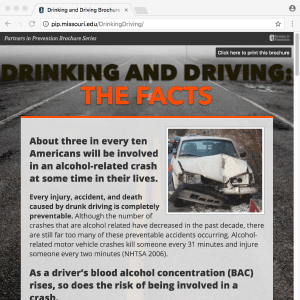 For more information on safe driving in Missouri, visit drivesafedrivesmart.missouri.edu. The risk of being involved in a critical crash is 23 times greater if the driver texts while driving. For front seat passenger vehicle occupant, safety restraints can reduce the risk of fatal injuries by 45% . Although 90.1% of people wear safety belts, 27.5 million people still do not buckle up. In 2015, over 391,000 people were injured by distracted driving. In 2016, over 3,000 lives were lost due to distracted driving. 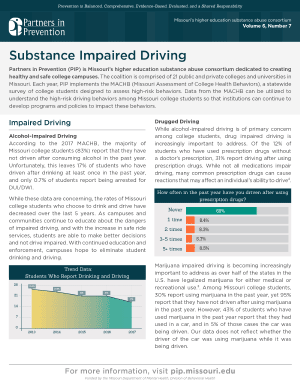 33% of Missouri college students who drive a vehicle while attending classes at their university report to sometimes drive while drowsy. 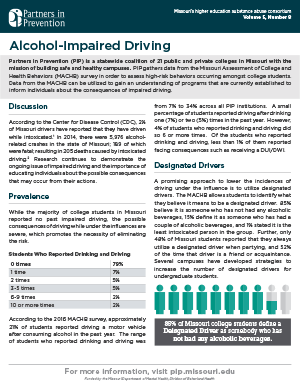 17% of Missouri college students who drive a vehicle while attending classes at their university report to drive 10 or more miles per hour the speed limit most of the time. 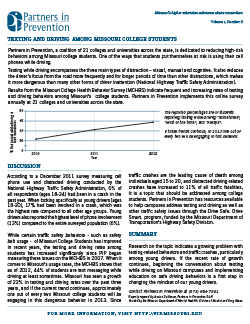 In Missouri, 71% of aggressive driving involved fatalities involved speed. BAC is the amount of alcohol in a person’s body. A 0.08% BAC is the legal limit for driving under the influence (DUI) or driving while impaired (DWI). Call a taxi/ridesharing service or call a sober friend to pick you up. 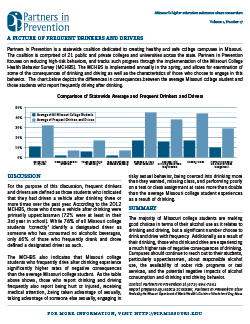 Visit cheers.missouri.edu for a list of establishments across the state that offer free non-alcoholic drinks to the designated driver. Be sure to have the proper information in your vehicle, including your driver’s license, proof of paid insurance, and your vehicle registration at all times. Safety belts should be worn at all times. When a vehicle is involved in a crash, passengers are still traveling at the vehicle’s original speed at the moment of impact. Avoid speeding and aggressive driving by leaving early and allowing extra time to get to your destination. Always keep a safe distance from the vehicle ahead of you. Some prescription and non-prescription medicines may affect your driving. Be sure to talk to your doctor or read the “When Using this Product” section on the label that mention drowsiness or impaired driving. Keep your eyes on the road and your emotions in check, put distractions down and out of reach, and do not reach for items while driving. Make it a priority to get enough sleep to avoid driving drowsy. Drinking caffeinated drinks is not always enough. Driving while impaired is illegal. Consumption or use of alcohol and/or other drugs slows reaction time, decreases awareness and impairs judgment. Texting while driving affects you visually, manually, and cognitively. If there is rain, fog, snow, or other inclement weather, turn on your headlights. In foggy weather, do not use your brights. Before exiting your vehicle, watch for on-coming traffic. Always call the police when an injury or fatality is involved. If you cannot move your vehicle, protect the scene with flares or by raising your hood. Exchange contact information with other drivers involved. Never leave the scene of a crash without exchanging information or calling the police, when appropriate.